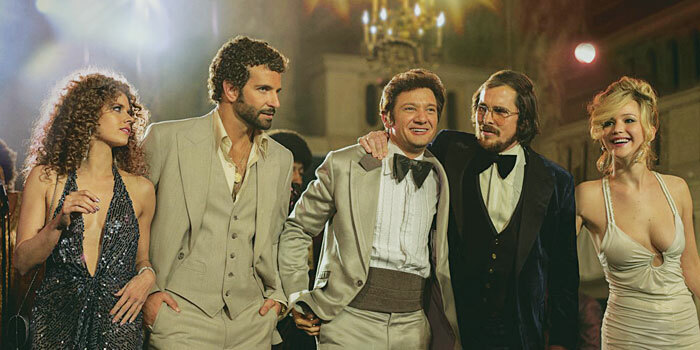 A still from 'American Hustle'. From New York, Northup is a free black man who is abducted and sold into slavery. 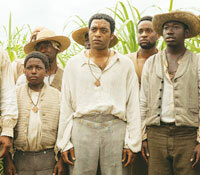 Steve McQueena��s British-American historical drama is an adaptation of the 1853 autobiography by Solomon Northup. Boasting an impressive cast it includes a�� including a moving lead performance by Chiwetel Ejiofor, Michael Fassbender and memorable cameos by Paul Giamatti, Benedict Cumberbatch, and Alfre Woodard. According to McQueen, a�?I live in Amsterdam where Anne Frank is a national hero. Shea��s not just a national hero, shea��s a world hero, and for me this book read like Anne Franka��s Diary but written 97 years before a�� a firsthand account of slavery. I basically made it my passion to make this book into a film.a�? In the running for: Best Picture, with Ejiofor for the Best Actor. Alfonso Cuaron had to come out with new filmmaking techniques for his movie, Gravity. About a medical engineer and an astronaut who work together to survive an accident in space, the movie sees splendid acting by Sandra Bullock and George Clooney. Cuaron, who co-wrote the movie with his son Jonas, had to make his own set of tools to shoot the movie. In an interview he said, a�?I thought about building bigger sets because I was going to do it in a more conventional way, just moving the camera upside down. And once we started, it was clear that that technology was not going to make it.a�? In the running for: Best Picture, with Sandra Bullock for the Best Actress award. In the running for: Best Picture, with Amy Adams for Best Actress and Jennifer Lawrence for A�Best Supporting Actress. In 1990, when Leonardo DiCaprio was making Titanic reel time, young Wall Street broker, Jordan Belfort, was living the life of a modern-day Caligula, in real time. The Wolf of Wall Street, co-starring Jonah Hill and directed by Martin Scorsese, is inspired by Belforta��s memoir. Caprio has been making news for signing big movies like Django Unchained and last yeara��s most-talked about film, The Great Gatsby. Caprio during an interview recently said, a�?Some of my favorite films of all time have been a reflection of the darker side of human nature. I wanted to do a film that to me was a depiction of what I felt are the times that we live in.a�? In the running for: Best Picture, with Caprio for Best Actor. In the running for: Best Picture, with Tom Hanks for Best Actor. Like writer-director Spike Jonzea��s earlier films,A�Being John MalkovichA�andA�Adaptation, Her is odd and ambitious. But despite the complex subject, Jonze insists that the movie is just an old fashioned love story that sees a lonely man, Theodore (Joaquin Phoenix),A�fall in love with a female voice, Scarlett Johansson, on his operating system. Jonzea��s major challenge was making a film with two characters, where one is just a voice. Directed by the brothers Joel and Ethan Coen, the movie shows a week in the life of a folk music singer-songwriter from 1961, New York. Although Davis, played by Oscar Isaac, is a fictional character, parts of the film are inspired by the life of folksinger Dave Van Ronk. What makes the movie interesting is that all the songs were sung by the actors and they were all recorded and filmed in one take. In the running for: Best Picture and Best Original Screenplay.